WAPT Pro can automatically search for dynamic data during recording. On the Parameterization tab of program settings you can specify the search options. There are 2 ways of search for dynamic data in WAPT Pro. If you know that some dynamic value is always surrounded by the certain strings on the left and on the right, you can specify those strings and organize the search. For example, you know that session IDs on your site are always placed between the same delimiters: "SessionID=" on the left, and "&" on the right. To organize the search, you should check the option "Search for strings between specified boundaries" and specify the boundaries. In this example, the left boundary is "SessionID=" and the right boundary is "&". If you know that dynamic data on your site is kept mainly in the hidden fields of HTML code, you should check the option "Extract to variables values of hidden fields in HTML forms". Then the program will look through all hidden fields of HTML pages during recording to find the dynamic data there. If WAPT Pro finds dynamic values in responses during recording, it automatically creates the corresponding variables. Variables are further used to calculate values of parameters in subsequent requests and also correct URL paths of subsequent requests depending on page content. This feature considerably simplifies the design of tests for pages with the dynamic content. For details, see the topic Automatic Parameterization of Dynamic Values. 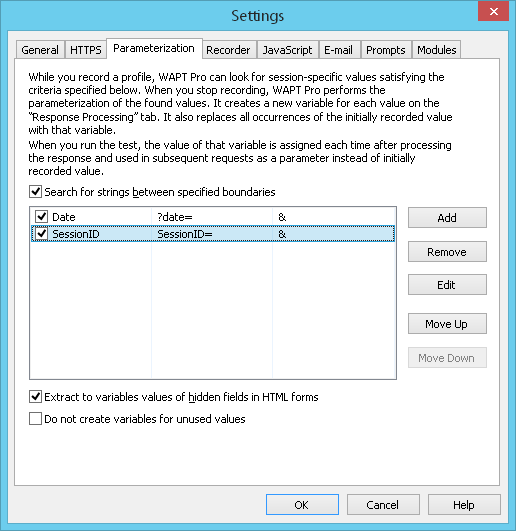 Search for strings between specified boundaries: If this option is checked, WAPT Pro will search for dynamic data during recording located between the certain strings - left and right boundaries. Extract to variables values of hidden fields in HTML forms: If this option is checked, WAPT Pro will look through all hidden fields of HTML pages during recording to find the dynamic data there. Do not create variables for unused values: If this option is checked, WAPT Pro will create variables only for used values. For example, if some hidden value in the form is not used anywhere in the test scenario, WAPT Pro will not create a variable for it. Add: Opens a dialog for adding a new parameter in the parameterization search. 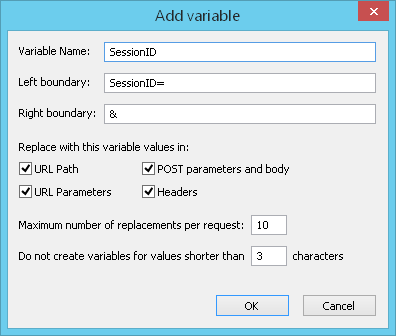 Variable Name: Here you can change the name of parameter. Left boundary: Enter the text string which is the left boundary of the dynamic value being searched. Right boundary: Enter the text string which is the right boundary of the dynamic value being searched. Check entries where the found values should be replaced with this variable: URL Path, URL Parameters, POST parameters and body, Headers. Maximum number of replacements per request: This is the maximum number of replacements of dynamic values that can be done per one request. Do not create variables for values shorter than _ characters: If this option is checked, WAPT Pro will not create variables for values shorter than the specified number of characters. Remove: Removes selected parameter from the list. Edit: Opens a dialog for editing the selected parameter. Move Up: Moves the selected parameter one step up in the list. Move Down: Moves the selected parameter one step down in the list.